I was teaching recently in Texas at Central Market, and I’d have to say after spending a week there, it’s the best supermarket in the world. I was using the marvelous citrus fruits they foraged from around the United States, including fresh yuzu, limequats, jumbo pomelos, bergamots, Seville oranges, citrons (which I’ve been trying to find in Paris—anyone know where I can find one? ), and Meyer lemons. Not only was there a bountiful display of citrus in their stores, but they had a great selection of cheeses, including locally made goat cheese from Paula Lambert, as well as plenty of others from France and elsewhere. When I was coming up with desserts that used citrus in them for the classes, I thought it’d be nice to combine tangy goat cheese with the sweet, fragrant zest of fresh lemons. 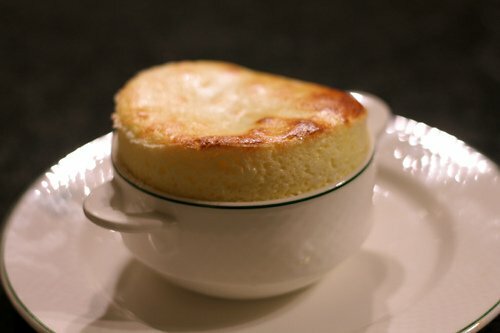 At first you might raise an eyebrow at using cheese as a base for a sweet soufflé. But somehow the mixture magically transforms into something cheesecake-like in flavor, yet much more intriguing. Make sure you use fresh goat cheese. Aged goat cheese, that which has a rind, is likely going to be too strong and for this soufflé. I do take a shortcut and use cream cheese as a base, so I don’t need to make a batch of pastry cream, which is often used as a base for dessert soufflés. When I was teaching the classes, I said at one, “I’m not a fan of sweet things”, which brought a chuckle from the guests. 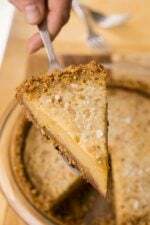 But I’m not big on overloading things with sugar and often prefer desserts with tang and tartness. Soufflés are a lot easier to make than you think. If you can make a cake, you can make a soufflé. In fact, the first thing I ever baked was a soufflé. My parents had left me home with a frozen tv dinner way back when I was a kid, so I opened my mother’s Settlement Cookbook and landed on the page for Chocolate Soufflé. Since it included things we already had on hand—Baker’s chocolate, sugar, and eggs, I improvised using a Pyrex measuring cup, which I buttered and sugared and baked the soufflé in. I’m certain this mixture would be great spread over some lightly sweetened berries or orange segments then topped with crunchy sugar crystals and baked in a gratin dish, which I’m going to try when berries are in season. As mentioned, this soufflé is on the less-sweet side. 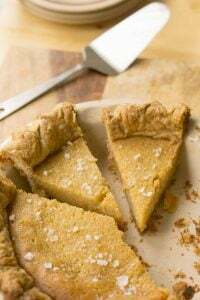 Be sure to put a nice blanket of sugar on top, but if you like things on the sweeter side, you can add an extra tablespoon of sugar to the base. 1. Liberally butter four 4-ounce ramekins or custard cups. Sprinkle a few spoonfuls of the additional sugar inside, tilt the dish to spread the sugar and coat the bottom and sides, then tip out any excess. Set the ramekins on a baking sheet. 2. Preheat the oven to 400ºF (200ºC). 3. Use a whisk, or an electric mixer with the paddle attachment, to mash the cream cheese, egg yolks, goat cheese and lemon zest until the mixture completely smooth. 4. With an electric mixer, or by hand, whisk the egg whites in a clean, dry bowl (not plastic) until frothy, with the salt. Increase the speed, until the whites begin to mound and hold their shape. While whipping, gradually add the sugar, one tablespoon at a time. Once you’ve added all the sugar, beat until stiff. 5. Fold one-third of the beaten egg whites into the goat cheese mixture, then fold in the remaining egg whites just until incorporated. It’s okay to have some tiny bits of white; that’s preferable to overfolding the batter. 6. Scrape the batter into the prepared baking dishes, gently smooth the tops, and sprinkle the soufflés with an even layer of sugar, about 1/2 teaspoon each. 7. Bake the soufflés on the middle rack (or slightly higher, if possible) of the oven for 10 to 15 minutes, until the top is browned and the soufflé is just set but still very jiggly in the center if you nudge it. Depending on your oven, it may take slightly less or more time. Soufflés are best when slightly runny in the center. Variation: If you’d like to add a bit of lemony tang to the soufflés, squeeze a few drops of fresh lemon or citrus juice over the soufflés after you sprinkle the tops with sugar. Note: Fresh goat cheese is often found at well-stocked supermarkets and farmer’s markets. You can also check out my tips on How to Find Foods Mentioned on the Site. Great use of the goat cheese, always enjoy the fresh markets and finding local fare. And the sugar topping makes for a great crusty browning too. Have a safe trip back to Paris. As a Texan living in Italy, I dearly miss my Central Market! And Meyer Lemons!! Thanks for posting this recipe – I really wanted to make it to your lesson there but I left town the day before you held it! I don’t know where you’d get citrons this time of year but I know where you can get citrons in mid-fall. Any neighborhood with Orthodox Jews. We use them for a holiday (Sukkot) and you’ll even get to take yours home in a nifty box, carefully tucked between pieces of environmentally-awful foam. Try towards the end of the holiday for better prices. If you make friends, people may give you theirs at the end of the holiday, free of charge. 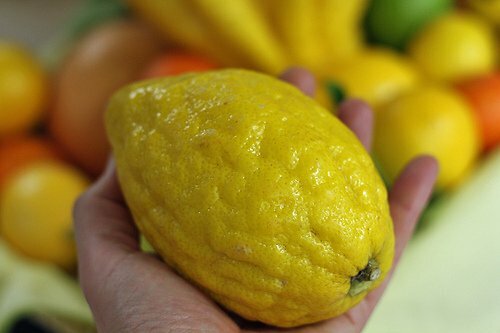 Your mileage will vary, but improve if you call it an etrog. What do you use the citrons for? I’ve seen them used in marmalade, liqueur flavoring and wonderfully aromatic potpourri. Hi de Chazeaux: They’re called cedrat in French and yes, they are used for the Jewish holiday of Sukkot which makes me think I’d be able to find them in one of the épiceries in the Marais, but I haven’t seen them. Nor have I been able to find one in a specialty fruit or vegetable market. It’s odd because I see them in Italy (where they use them for pan forte) and in California (and obviously Texas) during this time of the year. I candy them and use them for marmalade and homemade pan forte, too! I’m a Texan who’s been living in the northeast for 10 years, and I’m always trying to convince people that CM is the best supermarket on earth, so thank you for lending some authority to my argument! 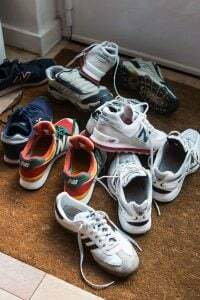 And as an Orthodox Jew, I’d also be interested to hear what you do with the citrons, since I end up paying a lot of money for one every fall, only to discard it once the holiday is over — I’d love to know how I might get some more mileage out of it. I’ve made your Goat Cheese Custards before which were absolute heaven and these look delicious! We’re not lucky enough to have Philly cream cheese down here in the south yet so I’ll have to try it with Kiri. I wonder too if my homemade chèvre would work…Guess I’ll have to try and find out! 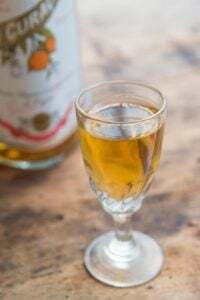 There’s a citrus festival a few miles from us every February, la Fête de la Bigarrade, where we can purchase all sorts of different lemon and orange varieties. I’ll have to look for the yuzu this year. I’ve never tried one. I cannot wait to try this recipe! I make my own goat cheese and am always looking for a good recipe…this looks like a great one! I can see the goat cheese working in a sweet dessert, though a bit unusual. I recently ate a sweet tart made with fresh sheep cheese, covered by a thin layer of aged cheep cheese, and I loved it. @de Chazeaux: in Southern Italy citron is also eaten in a savoury salad with salt and olive oil. You actually eat the white part between the zest and the pulp, which is huge and sweet in citron, and which you usually throw away in other members of the family. Amazing variety in the citrus family, isn’t it? I want this more than I can even express. Glad you enjoyed being at Central Market! I know I can find almost any kind of food there from almost anywhere in the world. Now if they would only stock fleur de sel Guerande. The Settlement Cookbook! My mom give me her copy when I moved out years back and have never heard of anyone else having this gem. The way to a man’s heart on the cover…classic. Absolutely beautifully done; I love goat cheese! I love Central Market for what they carry but LOATHE the layout of that place. Holy hell, I’ve never been run into so many times in my life as the times I brave there! Narrow windy aisles and giant carts. Great products but its the IKEA of grocery stores. 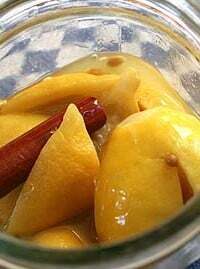 I don’t know anything about the citrons, but I sure do wish I could find meyer lemons in Paris. Have you ever come across them here? Lore: There are bergamots here in Paris, which you can find at some markets and natural food stores. They’re sometimes called citrons doux (sweet lemons) and while they’re not officially Meyer lemons, I think, they are closer than those which are called bergamots in the states. 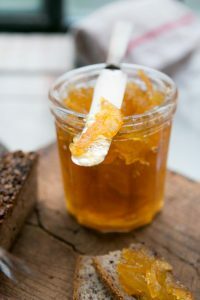 You can read a bit more at it at my post for Bergamot Marmalade. This souffle looks wonderful. I’ll have to try it this weekend. So glad that you love Central Market as much as I do. I lived in Austin for a year (many many moons ago) and CM was my go-to place for incredibly fresh fruit and an awesome selection of cheeses. It was there that I “discovered” white peaches, international cheeses, and sweet pickle chunks (CM has forever spoiled me for any sweet pickle). I miss it so much but am consoled by the meyer lemon tree in my backyard in “sunny” SF Bay Area. I wasn’t sure I’d like this dish at the class, but it was sublime! I wanted to eat the demo sized one you had up front! I’ll make it this weekend for sure. I also stocked up on some of the citrus downstairs in the produce department at Central Market. Half a dozen meyer lemons and blood oranges. I’m not sure what I’ll do with them but I’m sure I’ll figure something out! oh these were so delicious. There are so many good places to get REALLY fresh goat cheese here in Houston…I may have to nab some tomorrow at the Houston Dairymaids warehouse and have some soufflé fun. I guess your destiny as the best baker ever was sealed when you made that chocolate souffle… honestly, how can someone pick the most intimidating dessert ever as the first thing to bake in their life? But did you visit Wheatsville?! I like Central Market and am a regular shopper there, but Wheatsville is the best grocery store on the planet. Love the idea of using goat cheese for a sweet souffle. Who knew Texas had such a citrusy stronghold? Oh yum! Thanks David. 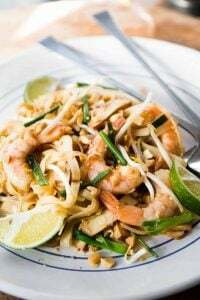 I can’t wait to make these, probably Saturday for a dinner guest. That should blow her socks off. Nothing I love more than goat cheese and souffles. Can’t wait to combine them. My Meyer lemon trees are full of fruit right now and I’m so happy. Wish I could share them with you. I love your idea about trying the mixture over berries. Wouldn’t that make it sort of a clafouti? Or just a berry gratin? David, I loved everything you made at your Austin class but I think this souffle was the standout dessert for me. Thanks for sharing! Come back soon! And hooray for Central Market! It does rock, doesn’t it? I love that you as a child made a souffle to go with your TV dinner. Clearly you found your calling early in life! So glad to hear you enjoyed Texas! I was in Fort Worth for the holidays, and literally missed your class there by mere days. It was oh so sad….. Meanwhile, Central Market is in fact, the happiest place on earth. A wall of potatoes?! Half an aisle of hot sauce? And dear me, the bakery. Its not a trip home without three-seed bread and love dip. My husband and I attended your Fort Worth Central Market class and were so thankful to sample your array of citrus-y perfection. We sat in the back at a small table so that I could savor (and shovel down) each one with pregnant abandon. While the chocolate cake was my particular favorite, my husband enjoyed the goat cheese souffle best. Thank you for such an enjoyable evening! This sounds like a winner. My husband doesn’t like goat’s cheese, so I’ll have to add it to my husband’s-on-a-business-trip menu, which is longer than you’d expect. I mean, who doesn’t like duck? Or mussels? Or feta? Weirdo. Love the image of you baking a soufflé in a Pyrex measuring cup :) When are you going to write your pre-Paris memoirs?? that lemon looks like it came from the Amalfi Coast…Sorrento! Since I was unable to make your class at CM, I am anxious to try this recipe. I plan on making a trip tomorrow to stock up on all the wonderful citrus and goat cheese. Thanks for the recipe. I agree with Jessica on the layout and shopping chaos at CM. Hoping you will return another time. Yes. As much as I love your sweet recipes, I also love goat cheese. So yes. Forever yes. Hello from Austin! Loved your article about barbeque in our vicinity — but did no one take you to the Salt Lick in Dripping Springs? And did you make it to the Whole Foods Market ‘mother ship’ here? How about Fonda San Miguel for interior Mexican food? Your souffle sounds incredible! I love goat cheese and I love Meyer Lemons! 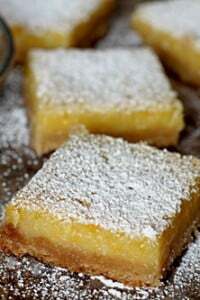 I added a link to your recipe to my latest post on Meyer Lemons- great timing! I am giving away a 7 pound box of Organic Meyer Lemons from California. I wish you were living in the US because I would get you a box too! I love reading your posts both for the recipes and for the humor. I have to say that some of the people who leave comments are pretty funny as well! I’m not sure how I missed the fact that you’d be teaching classes in Texas (one of my fav bloggers at one of my fav stores…where’ve I been!? ), but I’m sad I missed it! I definitely would have tried to attend! Good to hear you enjoyed your time in Texas–I hope you’ll come back one day! This may sound crazy, but how do you think it would work out if I took your gratin idea in a slightly different direction–pie? I’m thinking about maybe putting orange segments on a partially blind baked crust, then put the cheese mixture on top and bake it for…probably less time than the souffle. What do you think? Does anyone know where I can find Buddha’s hand citron in the UK? Whole Foods in London don’t stock them and so far I’ve had no luck with Asian shops either. I keep on thinking this would be good over blood oranges..maybe in a gratin, or with blood orange segments at the bottom of the souffle dishes. Skippy: I think the mixture is too loose for a pie. You could try something like just masking goat cheese, cream cheese, and eggs (or just the yolks) and sugar, but am not sure of what proportions one would use. Perhaps find a cheesecake recipe and adapt that? courtney: I announced the classes here on the site, and I post them on Facebook, Twitter, and in my newsletter as well. I also post appearances on my Schedule page, so you should check there from time to time, too. Great share I am impressed and I can relate to you. When I cook I am really always after the fresh ingredients… and believe it or not I searched the local market for ingredients. I am amazed with the abundant choices. YAY! I was hoping you’d post this! After it was mentioned in the comments of an earlier post, I was truly green with envy at being in the Frozen Northeast instead of Texas… And there are Meyer Lemons in the fridge as well! It can snow all day – I’ve got something to do now! This looks gorgeous. I can not believe I haven’t tried to make a souffle; I just know my family would love it. I wish I had the opportunity to shop at a famous market. I walked through the Viktualienmarkt while I was in Munich, but I never have time to really look. But I am sure it doesn’t compare to the famous Central Market. My friend Elizabeth was at your demo at Central Market and has been glowing ever since. She sent me this link and I am planning to make this weekend. I cannot wait to make it, in fact. Simple, clean, rich and most importantly…delicious. What a perfect weekend dish! Thanks for sharing the recipe. As I read your run-down of citrus fruits & description of the bergamot, I think you’ve solved a question I have had for the past 10 years! When in Belgium for a conference a decade or so ago, I purchased several interesting-shaped yellow/orange citrus from a weekend morning marché, without really paying attention to what they were called–they just looked good. They were the most exquisite tart/sweet experience & I have never been able to find such citrus again (nor did I even have much of an inkling as to what it was I had eaten). It sounds like they may well have been bergamots … now, at least, I have more of an inkling of what I’m looking for, futile though such a quest may be in the frozen northeast! Thanks for the bergamot advice. I’ll keep an eye out for them. I think it’s is worth you taking a trip down to Menton in Feb for your citron search. I went last year from London for the Festival du Citron which was a very strange, Cowboy-Western themed affair in a boarded-off part of the road. I’m in Paris this weekend and would love to buy you an ice cream at Bertillon – I’m an old chum of Mona Talbot & Clare Ptak. Please do email me if you have a spare min. Sounds wonderful. 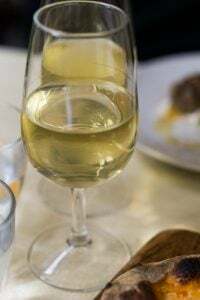 We have lots of fresh goat cheese and citrus available here in Northern California and I will try your recipe this weekend. I was at the Fort Worth Central Market and LOVED your class :-) The goat cheese souffle was my fav and I am looking forward to making it with your suggestion of berries or fruit in the bottom. We are so lucky to have a Central Market so close! Thanks again for the delightful class and desserts! They sell Meyer Lemon trees here in France, and you can keep them in a pot, if you have some place sunny to keep them outside during the summer, and inside, protected from chills, in the winter. They are not very large, and could even be kept in a Paris apartment, if it has the room (I know what they are like…) We have one down in Bordeaux, and just harvested 5 lemons, which we brought with us up to Paris, where we are staying for a month….. I have to say, this was one of my favorites from class (I attended the one in Dallas). I hope you had a good tour of Texas and thanks for teaching! Oh, and I have to agree that CM is the best supermarket ever….I always find something new and interesting that I’ve never had before. Yum! I have made cheese souffles, yet never with goat cheese. I am going to make these for breakfast! Bah, of course you should be in Texas when I’m off stagista-ing in Tuscany, wish I coulda made it out and seen you at CM. That souffle looks right up my alley and I’ll be doing my damndest to reproduce it next time I can get a market and snag some decent, fresh, goat cheese. On the subject of not-so-sweet sweets, if you’re ever in Austin, TX again check out Walton’s Fancy and Staple on 6th st. When I worked there they produced what is still my favorite pastry ever (along with a great variety of excellent breads, pastries, etc); a rosemary infused mini goat cheesecake on graham cracker crust with blackberry coulis and local honey drizzled on top. Divine. As a Dallas resident and cooking instructor, I’m at Central Market once a week. I’m so glad that you like it so much. Sorry I missed you. I know Paula too and she has devoted her life to making artisinal cheeses and promoting them. I can’t wait to try the soufflé. I love goat cheese so this is a perfect combinIation of a great technique and a great ingredient. I’ve taught soufflé classes and I love that people are amazed how easy they are – if you know a few do’s and don’ts! I love goat cheese and this looks outrageous! I would eat this for any part of the meal! I tried your suggestion using blood orange segments at the bottom of the dish, drizzling the blood orange juice on top after the sugar. It was amazing when my spoon scooped some of the orange with the souffle. The blood orange juice was gorgeous on top! My mistake was baking it in a round dish instead of an oval gratin dish, so it was a little moist in the middle. Still, I still ended up with a beautiful visual, textural and flavour combination! Thank you again for an amazing class! Thank you for the great compliments regarding Central Market. I helped open the Houston Central Market years ago and I knew then that I was involved in something very special. Not only is it a great supermarket but a wonderful company to work for. the best ones are grown in kfar chabad in israel and they also have farms in italy that grow them especially for this holiday…. My boyfriend and I recently had dinner at Hatfield’s in LA, where they served a goat cheesecake with grapefruit that was absolutely incredible! I would have never guessed that those flavors would be complementary or that goat cheese would be such a great base for a sweet dessert. I can’t wait to try this recipe out. My lovely sister had given the book “The Sweet Life in Paris” to me as a Christmas present and the other part of her present was the class at Central Market! The book was great! All the insights you had about the differences between French and American culture were so funny! I actually found myself laughing out loud. My husband and I had a great time at your class. I was actually surprised that he would enjoy a cooking class…especially a dessert class. He enthusiastically told everyone he works with how funny you were! The next day, I made the Spiced Chocolate cakes with the carmelized white chocolate. They came out beautifully! The only change I made is that I substituted ground cardamom in place of the clove. The little cakes were so fragrant and light. The girls at work were amazed at the white chocolate sauce and how easy it was to make! The candied salted almonds are now going to be a permanent addition to my pantry as they are great on a spinach salad. I even tried a variation by adding vanilla and a touch of cinnamon…I know….Americans and our love affair with cinnamon, but what can I say…I love it! Thank you so much for your articulate words and thoughtful recipes! I am a big fan and am very excited to peruse your blog and find more recipes to cook. Are your “brownies american” any where on your site? Thanks again and keep up the good work! Oh and P.S. We Texans do love our BBQ, but hey I like it all…Kansas, Texas, Sauce, Dry Rubbed, smoked…whatever..just bring it on!! Oh my. I went out of town for a few days and almost missed this post entirely. THAT would have been a tragedy. I’m always looking for a way to use up just a bit of the goat cheese we get at our farmer’s market. Two Meyer lemon souffles ought to do quite nicely. This was the second souffle I have made. After not eating eggs for 30 years I am on an egg bender. These blew me away. Not too sweet, and like eating a cloud. the texture was amazing. I had them for dinner and may make them for breakfast too. Thanks for posting this, David! I had, serendipitously, exactly the right amount of cream cheese and goat cheese left over from other projects to make these. Tossed some blackberries with sugar and dropped four into the bottom of each cup (so the recipe yielded six soufflés). I preferred them more at room temperature than straight out of the oven. They were gorgeous, and delicious, and I will definitely make them again! I love souffles! So delicate and versatile on flavor depending on the person(s) palate. I will definitely try your recipe, fresh goat cheese sounds like a match in heaven with lemon zest. How do you think a Meyers Lemon compared to a regular lemon will vary in the overall outcome? I lived in Texas for three years, about 3 hours from the nearest Central Market; even with the commute I still shopped there at least once a month and sometimes more if I could justify the trip. Such fruits and cheeses and beers and meats … Like you, I’m of the opinion that they are the best grocery stores EVER. I miss them so much since I moved out of state. I want this. Right now. I just need to buy some dishes and take a trip to the supermarket. 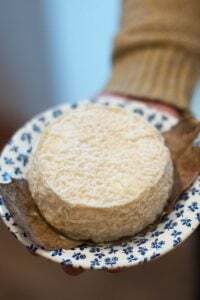 Goat cheese is such a wonderful cheese, creamy and flavorful but not overpowering.